I'm being completely honest when I tell you that last year was challenging for me. You see, I was exhausted at the end of 2015 and ended the year not really knowing if I wanted to be a wedding photographer anymore. I was saying "yes" to everything and everyone that came my way with the good intention of gaining experience, however, I ended up overworked and was losing myself as an artist. So I stopped. I put my camera away and took a very much needed break. I learned to say "no" to what seemed like cool opportunities but would eventually drain me. I learned to rest. I learned to be satisfied and content with the simple things. Slowly I was reminded of all the childhood dreams of mine that had been forgotten through the years: the hope I can do and be anything I want to be. From the start, this wasn't your typical wedding. The house where we stayed was tucked away in the jungle, miles from the nearest town. 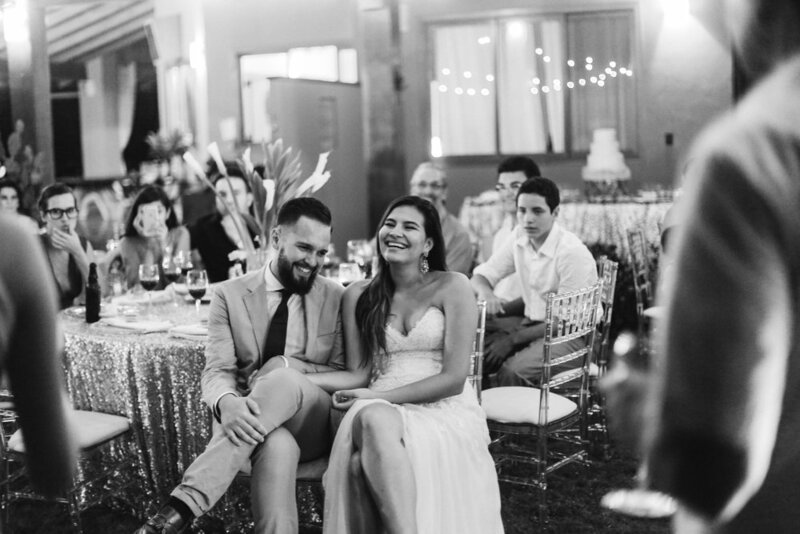 Only forty-six of their closest friends and family members were invited, those who had been a part of their journey and had watched their love story unfold. You could feel the genuine love and happiness in the air that weekend. Whether it was late night laughs in the jacuzzi or singing songs with the ukulele, they treasured every moment they spent together. The ocean and sky painted the most perfect backdrop as they read their vows to each other. The words read were more than pretty phrases, these words were promises of a sacrificial love to one another. Their friends had been witnesses of the great foundation these two had been building that eventually lead them to the altar. Nothing was over-the-top or trying too hard. They created an environment that was authentic and brought everyone's attention to what a wedding is really about. Two people saying "'Yes' to FOREVER. Yes in the good and yes in the bad. And yes, life is short and life is hard, but I found someone to walk through it with me. So yes, let's escape to the middle of no-where and do nothing but celebrate what a JOY it is to have and love each other for the rest of our lives." This whole experience showed a new direction I wish to take with photography. I don't want to hit copy-and-paste at every wedding, instead I want to tell true authentic love stories that are unique to every couple. This is what brings life to me and my work. For the next few days I will be posting their entire story on my blog. Make sure to stick around for that. Good night!